The biggest fear for all hikers (other than Grizzly bears!) is not being able to continue to do what they love through injury. Over the years we’ve helped many walkers to continue to get out there. The conditions we’ve seen have been far ranging but usually come from similar restrictions and bio-mechanics that we look to address here. Classically knee pain is the most common condition we see. Some people struggle uphill, most struggle with the down hill. This is not arthritis or age! This is merely due to muscle tightness affecting the sensation in the knee. The next most common condition we see are sprained ankles, usually from uneven ground. Ankle sprains do get better in time but if untreated they can cause compensatory movement patterns elsewhere which may result in longer term pain in the ankle or elsewhere, classically in the lower back. With the right knowledge and treatment these and other conditions can easily be cured. If you are in pain already then we suggest you give us a call (01793 613352) if you’re not then we include a series of exercises here to make sure you don’t need us anytime soon. We focus on the avoiding the most common condition mentioned above but the exercise shown here will help avoid most overuse conditions. Now I would expect (and hope) that this is very obvious to anyone reading this article. A good boot with ankle support has saved many a hiker from ankle sprains. Whatever you do don’t do what seems prevalent in Japan and go hiking in stilettos! (no I couldn’t believe it either). If you’re in two minds about the terrain always go with ankle support. Modern boots are plenty comfortable enough – unless of course you’re fell running. Watch out that your grips aren’t wearing away. We’ve seen a few “I’d been meaning to get new boot for ages” injuries. Basic but worth a reminder. These next 4 are the where we start affecting the knees. All of these should be able to be performed pan free. If you get pain or discomfort doing any of these then simply leave them out. We start with the easiest first. Ideally you would do the Lumbar Extension before the rest but first time through work up to it. Each stretch would ideally be held for about a minute. The nerve (femoral) which affects sensation in the knee runs between the quadriceps (muscles in the front of your thigh) and the adductors (muscles on the inside of your thigh). We need to keep these areas relaxed to minimise any extra tension on the nerve. Simply pull you ankle up towards your backside. If the stretch is comfortable then push your pelvis upwards and outwards, as if you were doing a pelvic thrust, to increase the stretch. This is the term we use for the bit between the adductors and quadriceps (see above). Simply find a table, chair or something of a suitable height and stand side on to it as shown. 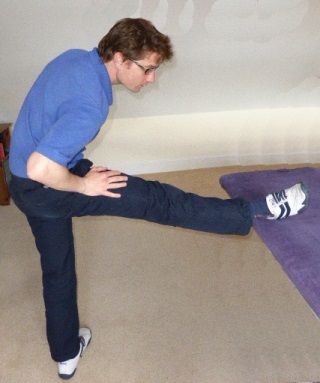 Put your foot up onto the surface and rotate the leg in so that the inside ankle bone is in contact with the surface. 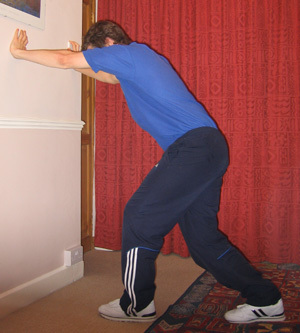 To increase the stretch bend the opposite knee bringing your body downwards towards the floor. Start by sitting on your haunches on the floor – feet pointed out behind you. Some of you may find it difficult to simply do this. If so just hold there. For the more flexible take your hands out behind you for support and push your pelvis up so it is flat as shown. For extra stretch tip your head back too. If you have an existing back condition you may want to leave this one out. Click here for information on Back Pain. This affects the area from which the nerve for the knee comes from. Simply lay across the sofa or bed or ideally a Swiss Ball and let everything relax as shown in the picture. If that sounds too scary or you don’t have an ideal space just let your legs hang off your bed and take your arms above your head. You can work up to the full one shown. If you tend to get issues at the back of your knee this is one for you. It can also help out with general knee pain as the mechanics require good hamstring contraction for a stable knee. Simply place the back of your heel up on a surface to lean forward to bring the stretch on. The variation which most people don’t know is to rotate the foot either inwards or outwards to affects different muscles (the hamstring are actually 3 different muscles). Can get tight especially walking up hill and particularly after an ankle sprain (see hiking in stilettos above!). The standard stretch is to take the leg out behind you and fully extend the knee. 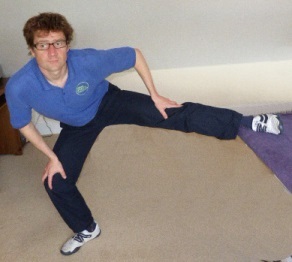 A lesser known stretch is to bring the foot forwards slightly and bend at the knee. You may need to turn your toes inwards for this one. This should stretch lower and deeper into your calf.